During the 1930's, as the Nazi Regime gained momentum, it became increasingly likely that hostilities would break out in Europe. With the mechanised warfare of the time fuels of all types became increasingly important. Indeed, Adolf Hitler himself declared that 'oil is necessary for victory'. It was, then, of great national importance when oil was found to be present in the ground strata at Kelham and nearby Eakring. D'Arcy Exploration Co. drilled a test hole within Kelham's boundaries in 1939. This borehole was the first of many. For British engineers oilfields and their specific engineering techniques were relatively new and progress was slow. A few weeks later, when war was upon us, speed of operation became essential. Oil fields were well established in America and the expertise of their oilrig drillers was called upon. Some difficulty in finding suitable accommodation for these 'Roughnecks' - a term used by themselves for themselves - was experienced. The need to be close to the wells and the need to have 24-hour facilities such as meal provision and a quiet environment for night workers to sleep compounded the problem. An unlikely solution was found. They would stay with the Fathers and Brothers of the Society for the Sacred Mission who resided in Kelham Hall. It worked, and worked remarkably well. The Monks and the Roughnecks, apparently against all odds, became compatible through their mutual respect for each other. Their relationship provoked the D'Arcy staff into such puns as 'Let's go to Kelham Hall and see what mischief the Roughs and Robes have been up to'. To the people of the village there was now 'a bit of cowboy land’ in our midst. ‘The Yanks’, as they were affectionately called, wore brightly coloured shirts- 'it looked like a rainbow to see coloured shirts arriving' and George Newton of Kelham Nurseries was 'rather impressed by the cowboy hats and boots.' George had worked in his father's gardening business all his life and used to speak with obvious affection when talking of Ray Hileman, the American oilman who enjoyed gardening. Ray had brought with him several packets of seed and soon pursued his hobby. It both satisfied the need for a pastime and also supplemented his rations. Obtaining sufficient food was a constant problem for the roughnecks who found it unbelievable that the English could live on such small rations- an amount demanded by the rigours of war and not by their personal choice. George would raise a few of Ray's seeds by growing them in the warmth of the nursery greenhouses and Ray would plant them out in a little plot at the rear of Kelham Hall. His speciality was celery that George declared grew 4' tall. Their mutual love of gardening developed into a good friendship during those bleak war years. The much-admired expertise of these American workers was a great help to our nation. Their assistance during the period 1943-44 enabled wells to be drilled in much reduced times and output increased during those vital war years. The oil was pumped from the depth of the well by an electrically driven nodding device. The 'Nodding Donkeys', as they were generally called, became a familiar sight within the Kelham Parish boundary. By the end of the war our oil wells had produced over 3,500,000 barrels of high-grade oil, that is to say almost 160 million gallons-- a great contribution to the 'war effort'. Oil production continued and further fields were discovered (and worked) all around our locality, even as far as Egmanton and beyond. In the late 1960's the oil in Kelham ran out and the wells were sealed. 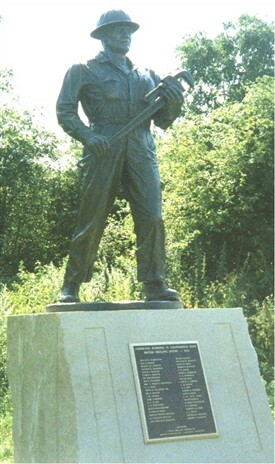 The picture illustrates the monument to the Oklahoma oilmen who worked at Eakring during WWII. This page was added by Jill Campbell, Nalhs Newark on 06/01/2013. It was exactky 100 years ago that oil was discovered at Kelham, just outside Newark. The Newark Advertiser newspaper reported it on 8th January 1913, saying that oil was discovered whilst a test bore was being made. Thirty years later an oilfield was established at Kelham Hills and was productive for several years, being a valuable resource (like Eakring) for Britain during the war years.